UPDATE 5/7 as of 2:30pm: Ivy Lane is now open. 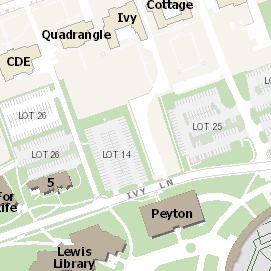 Due to crane work, the section of Ivy Lane immediately north of Peyton Hall (shown below) will be closed during the day on Thursday, May 7. Pleae note access to Ivy Club will be maintained. The pedestrian walk along the south will be closed, yet the north pedestrian walk will not be affected. The road closure is expected between 7 a.m. and 3 p.m. All efforts will be made to open the road earlier, if at all possible.